Olympus Dive Center hosting 6th Annual North Carolina Wreck•Shark Shootout - The Shootout is presented by professional photographer, Mike Gerken at Olympus Dive Center in Morehead City, NC. Each year divers come from all over the world to share a love of diving, underwater photography, sharks and wrecks and compete for big prizes in the competition. The NC Coast is famous for their numerous shipwrecks that are home to the prolific sand tiger shark; Carcharias taurus, cousin to the great white shark. The wrecks are also host to a myriad of marine species from up and down the food chain. Large numbers of jacks, barracudas, tunas, spadefish, cobia, giant stingrays, sea turtles and NST's (non-sandtigers) are seen with regularity. Join Mike and dozens of enthusiastic divers and photographers for an amazing week of diving. Enter your images into the competition and you never know what you might win. Prior to the start of the Shootout, sign up for one or both of the "Recon" dive days scheduled on Tue, May 28 and Wed May 29. These days are for scoping out the conditions to see where the best photo opps are. This is an opportunity to get your toes wet and sort out your gear or merely extend your diving trip beyond the 4 day Shootout package. Both of Olympus Dive Centers USCG certified dive vessels will be utilized to take divers out to the wrecks; the 65' M/V Olympus and the 48' M/V Midnight Express. Max number of divers is 43. These boats are spacious, fast and most importantly, safe. After the Shootout is over, we head to Wilmington, NC on Monday, June 3 to head offshore to dig for megladon sharks teeth. This is for experienced divers only. Six-pax dive boats will be utilized so space is limited. Reservations for this are a first come first serve basis. Cost is $325 per diver/per day for a 3 dives in depths of 110'. Contact Mike Gerken with any questions at mike@evolutionunderwater.com. An application will be sent in PDF format upon contact. Please fill it out completely and email it back to Mike@evolutionunderwater.com. I will then contact you with instructions on how to make payment along with an invoice. $915 - No Lodging - Attendee will take care of his /her own lodging. •Photo/Video Workshop - Mike will give up his secrets on how to get the best shots. 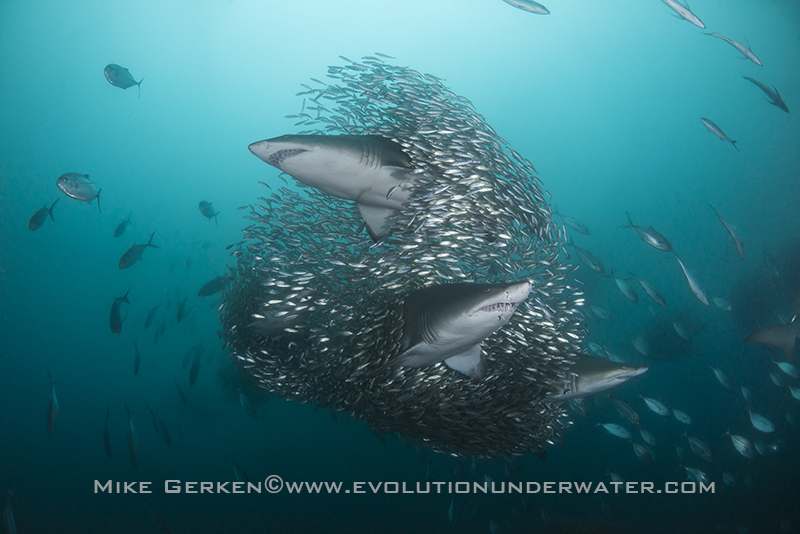 •Presentations - All things wrecks and sharks will be presented by Mike and guest presenters (to be announced). •Tank rentals and Nitrox fills. Visit this link for air and nitrox fill pricing. Visit this link for tank rental pricing. •Gratuities for the boat crew. A customary gratuity is between $10-$20 per day per boat depending on how you felt the service was. Visit this link for Diver Certification Requirements (Advanced Certified Divers Only!) This event is not for beginners. The organizers of this event reserve the right to refuse entry of any individual(s) to the event based on lack of experience regardless of certification level. A 25% deposit must be made to reserve your spot(s). Full payment is due 45 days out from charter date or space(s) will be forfeited. Full refund minus $75 admin fee will be offered up to 30 days of the event with no refunds within 30 days. Refunds will be issued if individual charter(s) are canceled due to adverse weather at a rate of $130.00 per day. An administration fee of $200.00 will be non-refundable regardless of the number of charter cancellations. This fee will cover awards dinner, cookout, judges and misc admin costs. Hotel refunds for the Bask will be available up to 48 hours prior to your check-in. Payment can be made with a check, bank transfer or credit card via Square or PayPal. A 4% fee will be incurred for Square and PayPal transactions. Attendees will be responsible for additional bank fees where applicable. Decisions to cancel a charter will be made the morning of each charter unless of a severe event such as extreme weather (see below). I strongly urge you to purchase trip/travel insurance and dive accident insurance such as Divers Alert Network (DAN) in the event you will have to cancel last minute and lose your deposit or worse your entire trip amount (read policy above). In addition, certain policies will protect you in the event of extreme weather cancellation or diver injury. Event organizer will be strict with the refund policy listed above. Diving will take place in the open ocean up to 36 miles from shore with depths ranging from 60 feet to 120 feet. Be prepared for choppy conditions but hope for flat calm seas. Take seas sickness medications as needed. During June water temperatures average in the mid-seventies with visibility averaging 50 feet and exceeding 100 feet on a good day. Some current is possible so be prepared for strenuous finning. Divers with physical disabilities may have difficulty climbing the dive boat ladders on days with rough seas. Diving North Carolina can be challenging so be prepared.